Opinion is divided on the recent strikes on Syria but I do not intend to make the case for or against that action here. I simply note that the coalition who support the action of the UK, USA and France include Canada, Germany, Australia, Denmark, and in fact all NATO allies and the European Union. The coalition who oppose it includes Iran, Russia and Jeremy Corbyn. Jeremy Corbyn believes bombs won’t save lives or bring about peace. The same cannot be said for the author & public speaker, law professor & dean of Durham Law School Thom Brooks. Thom is quite open about his support for the Labour party and makes it clear in his Twitter biography. 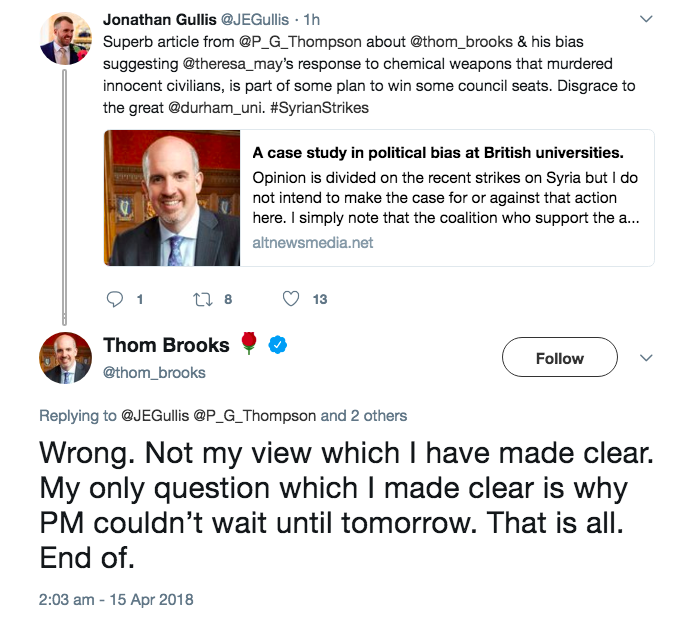 Thom has let his political bias override his judgement on more than one occasion. His behaviour brings Durham Law School into disrepute and raises a question as to whether he is a fit and proper person to hold the position of dean at such a prestigious institution. Thom has been promoting the most ridiculous conspiracy theory on Twitter today. He is making the case that Theresa May took this action to improve Tory prospects in the upcoming local elections. Setting aside the vile allegation that ANY Prime Minister of the United Kingdom would deliberately put our brave forces in danger the theory isn’t even logical. All polls show that the British people were not in favour of it. It is the difficult duty of the PM to do what she believes is right not what is popular and that is what she did whether you agree with her or not. 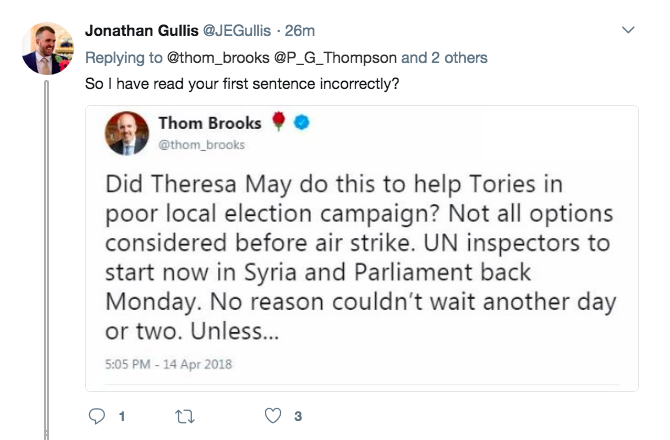 *Update – Thom has now deleted this tweet but not before AltNewsMedia saved it for posterity. Thom does not explain what Presidents Trump or Macron’s interest is in the outcome of the Westward Ho! (Torridge) ward election, or indeed any other wards. It is fair to say it is as ridiculous as it is hateful. It is not the first time Thom has demeaned himself. 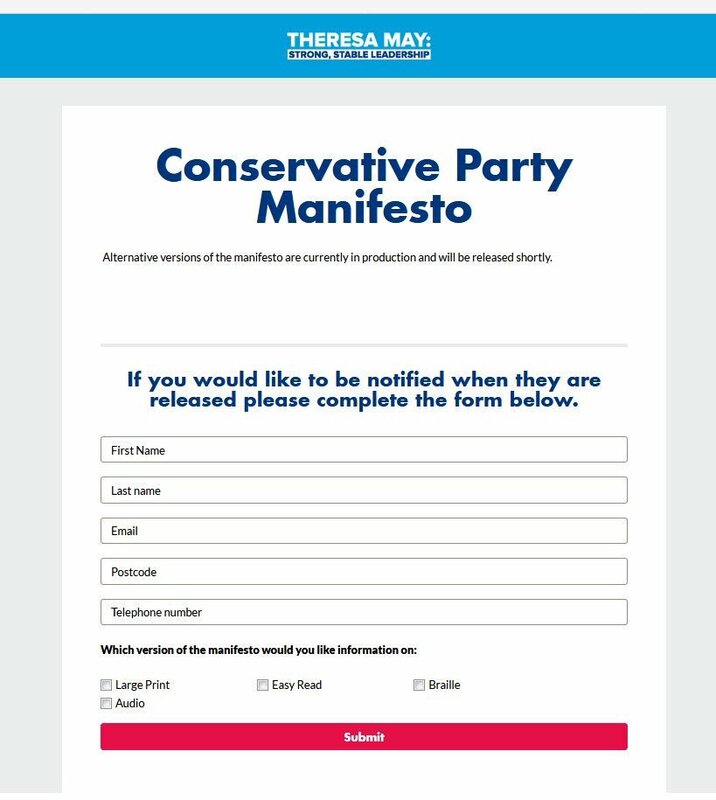 Take a look at the post below from the Conservative Party Website. In line with best practice the Party publishes its manifesto in alternative versions for the sight impaired. This of course is a good thing, one would think all decent people would welcome enhanced accessibility for people with a disability. Not Thom though, Thom saw it as an opportunity to make a deceitful attack. He posted a picture on Twitter where the ‘alternatives’ of Large Print, Easy Read, Braille and Audio have been cropped off. He then implies that the content was being changed. *Update 2 – Thom has also deleted this tweet, again we recorded a copy in anticipation of such behaviour. 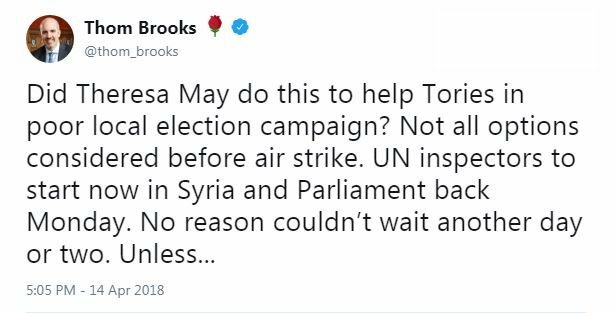 Whilst we have no reason to doubt the integrity with which May and Corbyn hold their differing positions on action in Syria. We have every reason to doubt the integrity of Thom Brooks. To coin a phrase “he has form.” It is worrying that so many with a hard left political bias are in such positions seeking to influence our youth through such immoral behaviour. *Update 3 – As if to emphasise his lack of moral fibre Thom made no effort to engage or defend his behaviour. Instead he deleted both tweets in the article and blocked the author. It seems he can make dishonest criticism of others but cannot take honest criticism of him. *Update 4 – 15.04.2018 – When you find yourself in a hole stop digging Thom. As can be seen in the screenshot below. 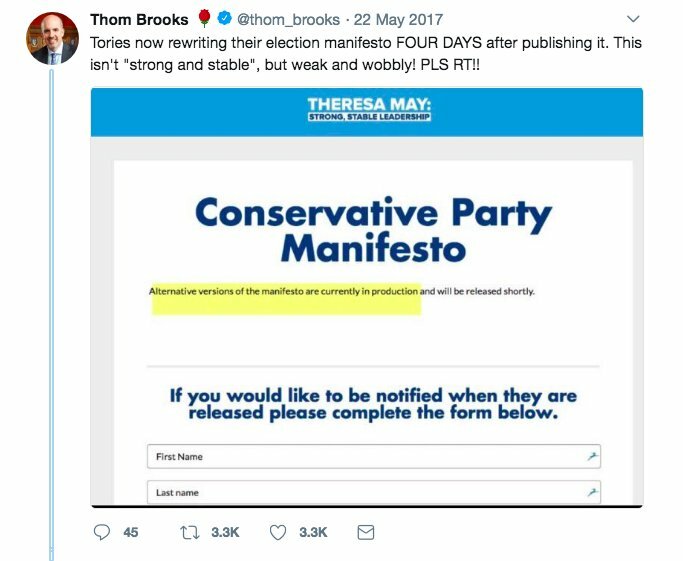 Thom has not only deleted the tweet but is now denying he ever said “Did Theresa May do this to help the Tories in poor local election campaign?” He now claims his ONLY point was why the PM could not wait until tomorrow. Readers at AltNewsMedia know that the truth can’t be so easily reinvented. It is good to see people will not let him get away with it. As the saying goes – the truth is out there.